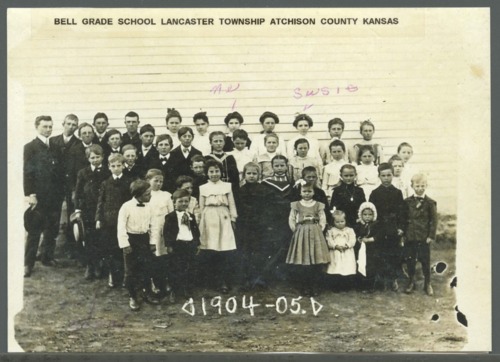 This is a photo of Bell Grade School #59 students and teacher, Lancaster Township, Atchison County. The photo is for the 1904-05 school year. The school was two miles north of Lancaster. There is also a souvenier program for the 1903-04 school year. The students are listed as Eddie Dorssom, George Dorssom, Albert Dorssom, Julia Dorssom, Willie Dorssom, Ruth Dorssom, Louis Buttron, Edna Fuhrman, Laura Fuhrman, Clara Gigstad, Gena Gigstad, Harry Gigstad, Gilbert Gigstad, Julia Gigstad, Elsie Keithline, Anna Hegland, Grant Hegland, Susie Hegland, Josie Buckles, Gladness Cole, Alice Burns, Nettie Burns, Joe Hartman, Adolph Kloepper, Freddie Kloepper, Clara Petersen, Elsie Petersen, Grace Petersen, Lotta Petersen, Fred Matthias, Dessa Matthias, Willie Matthias, Max Matthias, Gladys Nettleton, Edna Nettleton, Oliver Nettleton, Robert Nettleton, William Nettleton, Guy Rule, Leon Rule, Martin Trainer. The teacher is Henry L. McLenon.